The Department of the Interior (DOI) released a new report last week detailing the economic contributions of DOI activities and programs in 2016. According to the report, the “Energy & Minerals” category, which includes oil and gas development, accounted for the most jobs (638,630), value added ($75.9 billion) and economic output ($132.93 billion) of any category represented. Oil and gas activities (also includes coal) also supported 581,539 jobs, added a value of $68.26 billion, and had a direct economic contribution of $52.38 billion last year. The total economic impact, including indirect and induced impacts, was $117.7 billion or 46 percent of the total contributions for all DOI activities and programs, according to the report. But while these numbers are impressive and show the incredible importance of safe resource development on federal lands, they are only a fraction of what they could be. Though DOI public land and offshore oil and gas production accounted for roughly 25 percent of America’s domestic output of oil and natural gas in 2016, crude oil production on federal lands fell nearly two percent in 2016 while natural gas production has steadily declined since 2008 — roughly when the shale revolution began. “Between 2010 and 2015, the percentage of the nation’s crude oil produced on federal land decreased from 35.7 percent to 21.0 percent. And according to the Bureau of Land Management, the number of drilling permits issued on federally controlled onshore land dropped by 47 percent from 2008 to 2015. 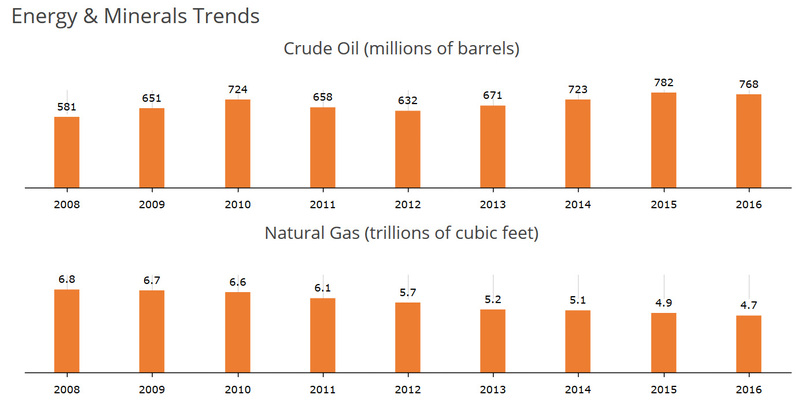 Further, federal data show crude oil production remained flat between 2010 and 2015 on federally controlled land, while natural gas production declined 27 percent. According to multiple media reports, the BLM had a backlog of more than 2,800 drilling applications as of Jan. 31. Such inefficiencies are especially problematic for states such as New Mexico. 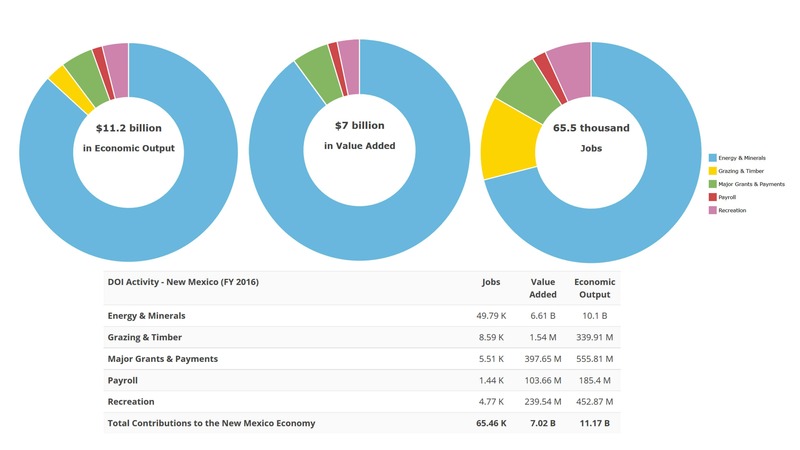 According to the DOI report, the Land of Enchantment had the fourth highest number of jobs supported by all DOI activities and came in third in 2016 for both value added and economic output, with “Energy & Minerals” accounting for the highest percentage for all categories. New Mexico ranked third across the board for “Energy & Minerals” with nearly 50,000 jobs supported (76 percent of total), $6.61 billion in value added (94 percent of total), and $10.1 billion in economic output (90 percent of total). Oil and gas production from federal lands accounted for $1.6 billion in total state revenue last year — a whopping 26 percent of New Mexico’s total budget. “In a state like New Mexico, where oil and gas revenue typically constitutes roughly one-third of the state’s budget, fixing BLM’s permitting issues will provide immediate economic benefits. “Operators working through BLM’s Farmington Field Office (“FFO”), which regulates all production in New Mexico’s San Juan Basin, have seen drilling permit wait times approach the 500-day mark, with an average wait time of nearly one year for a standard application for a permit to drill (“APD”) without revisions. By contrast, New Mexico’s Oil Conservation Division, the state agency handling drilling permit, approves APDs in 10 days or less. There is a renewed interest in New Mexico’s oil and gas industry in recent years with BP declaring in August that the Mancos Shale in the San Juan Basin “exceeded expectations” and “could become one of the nation’s top shale plays.” And in the Southeastern part of the state, the Permian “super basin” was recently reassessed and is estimated to soon surpass its production peak set in 1973. These recent developments could provide an even greater windfall for the state if changes are made to some of these resource development-stifling policies at BLM. Delay tactics being employed by extreme activists as part of the “Keep It In the Ground” movement have also contributed to decreased oil and gas activity on federal lands. This includes staging protests in Colorado, Ohio, Utah, Nevada, and elsewhere in an attempt to block or stop federal mineral lease auctions. In Ohio for example, the BLM spent four years studying the potential impacts of allowing oil and gas development on 40,000 acres located in the Wayne National Forest (WNF). To date, three lease auctions for parcels within WNF have amounted to just under $7 million with 95 percent of the acreage yet to be leased. Further, that’s just the lease sale amounts and does not include future royalties when wells are actually put into production. Oil and gas development continues to be an important part of the Department of Interior’s economic activities. However, current policies and delays are stifling production from achieving more than a fraction of its potential. In fact, these actions have led to decreasing oil and gas activity on federal lands at a time when development on private acreage is leading to record-breaking production.